Many behavior problems with dogs come from boredom. Modern humans are tied to work and computers to a degree where we're not active enough to keep our dogs happy. They need physical exercise and mental stimulation, and many dogs become outright destructive when they have too little to do. There are great puzzles for dogs where you can hide treats and the dog has to figure out how to get them out. Feeding time can also be a great activity. It's easy to just pour out some kibble in the bowl and let the dog gobble it down, of course, but a bored dog might benefit from a change in that routine. 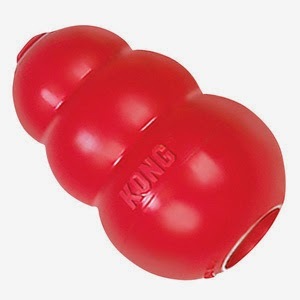 The classic Kong can be a dog lover's best friend. Many say, "I have one of those, but my dog doesn't play with it." On its own, it's not all that much fun. You need to stuff it with something. If you feed your dog kibble, mix some of it with some small treats and something sticky like peanut butter, cream cheese, or canned dog food. Fill the Kong and place it in the freezer. Now it will pose a challenge. Some dogs will lick the Kong until it's empty, others figure out that they can toss it around to get pieces of food to fall out. Most dogs take at least 20 minutes to empty one. There are many variations on the Kong theme. There are balls the dog has to roll to dispense food, and cubes that pose more of a challenge. Pick a size and quality suitable for your dog - strong chewers require strong toys. We have never had a Kong. Mom thinks they look weird so we don't have one. We have some Kong toys, though. I used to think they look weird too - especially the black ones, LOL. They do their job, though. My doggies also like the Kong Wubba, it's one of their favorite toys.